The electrical network must behave as an ideal source of voltage without any internal impedance, with sinusoidal output and constant voltage at all points of the power supply. Generators and the distribution system have a certain internal impedance which causes voltage collapses and losses in the distribution system. Sometimes the causes for the disturbances are external: atmospheric, all of which contribute negatively to the quality of the power supply. An increase loss thus causing lower performance. Electromagnetic compatibility problems (EMC): poor operation or untimely stoppages to the system and cause significant efficiency losses to production systems. Amplitude: temporal, power surges, sub voltages, etc. In the last few years, there has been great advances in the minimization of the effects of network disturbances on equipment supplied by them. On the one hand, the limitation of the conducive and radiated transmitters from the disturbing apparatus, although those due to Telecommunication Transmitters, Atmospheric Discharges and the Exploitation of Commercial Networks continue to exist. On the other hand, the reduction in susceptibility of the equipment to the disturbances. Despite the improvements, there will always be disturbances which cause failures and/or breakdown in equipment. What follows is a list of the most common effects. Those produced by induction of atmospheric discharges (lightning) to airlines. Those produced by abrupt variations in the load current, connections-disconnections of inductive or capacitative loads. 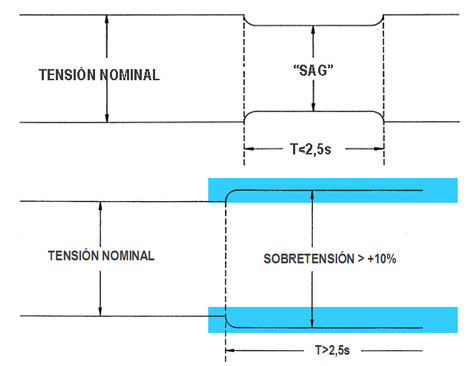 Effect: When they pass the anticipated limits, they produce break-downs in the isolations and semi-conductors. Short-circuits at the point of consumption, freed later by the corresponding protection. 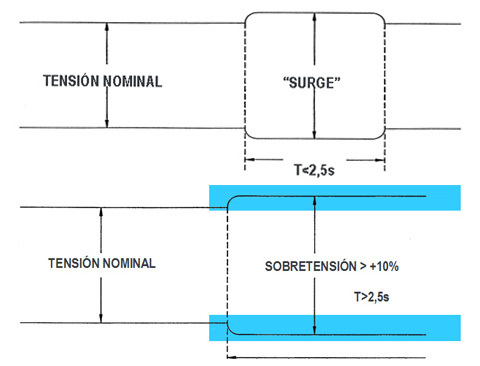 Interruptions in the supply produced by the commutation of lines and discharge of protective devices with automatic pickup. Effect: In equipment with memory or logical functions, a power outage (even if it lasts just a short time) often cause functional failures. IT equipment in general is very sensitive to these disturbances, which can cause an incalculable loss of information. Short/long-term over voltages due to a load reductions on networks with mediocre regulation (high impedance). In lighting installations, they reduce the life of the bulbs. In IT equipment, they produce failures in the power supply and monitors. These are short-term voltage collapses due to momentary or permanent overloads on the network. Motor-driven induction machines reduce their speed and increase consumption. The lighting installations with discharge lamps have dark spots. System stoppages upon entering the minimum voltage work station. A progressive collapse for various seconds, which often ends in a total supply failure. These are produced when there are strong disturbances in the exploitation of the networks and central energy producers. (Lack of power, loss of synchronism, etc.). Efecto: same consequences as an outage or dropout. A total failure generally due to the untimely activations of a distribution network protection device. Effect: The power outages inevitably stop the equipment unless they possess their own exterior independent energy system. But when the stoppage is produced in an untimely way, dangerous situations can come about as far as the safety of people and things, or also the loss of very valuable information (as is the case of IT equipment). Certain receivers consume non-lineal loads, that is, harmonic currents. These currents produce harmonic voltage collapses which modify the sinusoidal voltage wave originally produced (in the power station alternators). These are high frequency signals that superimpose the power supply voltage. They may consist of any defined frequency or broad band signal; stationary, flashes or repetitive impulses. They are the result of undesirable couplings to the commercial network lines with apparatus that use high frequency technology or commutation. According to the type of coupling, they can take on a common mode or differential mode form. Effect: These disturbances can cause all kinds of equipment failures: from operational failures to permanent damage. The interconnected continental commercial networks (as is the case with most of the European ones) supply an almost invariable frequency which is very close to nominal frequency. This is because it is controlled through a mega-system which includes a very large number of synchronized machines, with an enormous overall strength and an almost infinite inertia. On the contrary, on many islands and in other isolated areas or at independent installations with small electrical stations (or electrogen groups) substantial frequency variations are often produced. The variations are practically inevitable when there are connections or disconnections of comparable strength to the total strength of the system.